Looking for great party theme for boys? Well, as a mom of two girls I thought it would be fun to see what boys like! So, I did a little research and found some great party ideas parents have come up with for their precious boys. Thanks to Design Dazzle we found this awesome Western Birthday Party Theme for Boys, has to be one of the most creative ideas I found. 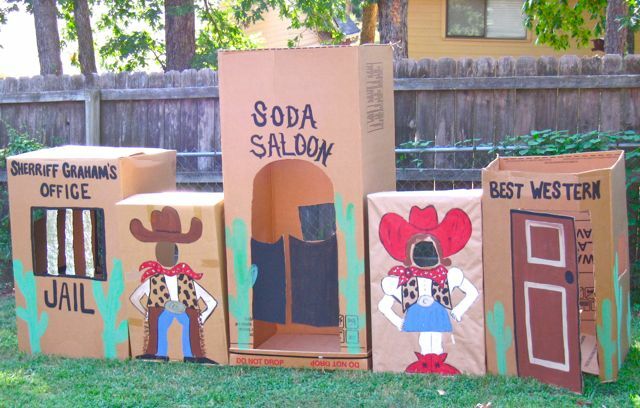 They used boxes to make a western town, great idea! The next idea came from Frosted Events. They went all out and planned a Camp Out Birthday Party, looks like it was loads of fun. The party came equipped with a tent, s’mores and more, fun idea! So, all my parents with boys, have you planned a themed boys birthday party or do you think these ideas are over the top? In terms of party, boys would want it to turn out to be full of action. A party packed with exercises in order to satisfy their adrenaline is definitely the best suited. You may also take into account boys birthday party ideas at BirthdayExpress.com.